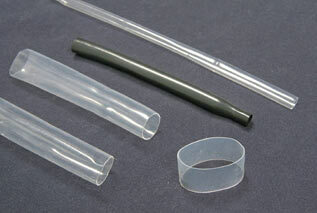 PTFE Heat Shrinkable Tubing provides excellent electrical insulation and pocesses many special properties that are not available in other tubing. Looking for 4:1 or Dual-Wall TFE?? Call us for a quote. FEP Heat Shrink Tubing is a semi-rigid fluorinated ethylene propylene TFE tubing rated for continuous service temperature from -55°C to 200°C. The excellent electrical and mechanical properties of FEP make it ideal for chafe guards on braided metal hoses where fittings must be cleared and as terminal & splice insulation. Outstanding chemical inertness allows FEP to be used as a cover over pressure and temperature probes in corrosive chemicals where different diameters are encountered. FEP is normally used where many of the properties inherent in TFE are desired but the shrink temperature must be lower. 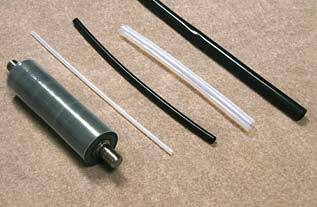 PTFE Heat Shrink Tubing is a unique Thermoplastic that possesses excellent characteristics for tubing used in high temperature applications, corrosive atmospheres, electrical insulation and as a lubricant. PTFE possesses the lowest coefficient of friction of any known solid, and is used widely because of its anti-stick properties.It is non-wetting and self-lubricating. PTFE heat shrink tubing has excellent chemical resistant qualities and is unaffected by all known chemicals except alkali metals, Fluorine under certain conditions and some Fluorine compounds at elevated temperatures. It is unaffected by weathering and has excellent resistance to outdoor exposure. PTFE has the widest working range of any plastics material (-250°C to 260°C), does not support combustion and is an excellent insulator for electrical applications.